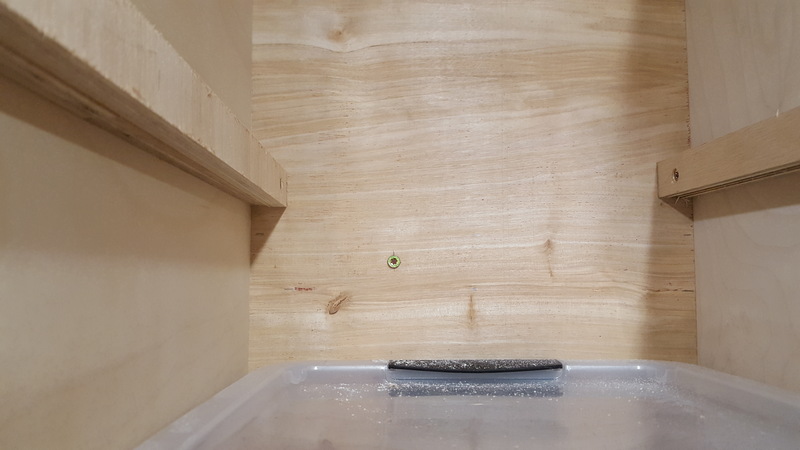 Most of the case is 3/4″ Birch plywood. I cut out the sides, top, and bottom and used 2 1/2″ pocket screws to assemble the case. The back is a piece of 1/4″ plywood underlayment that I had laying around. 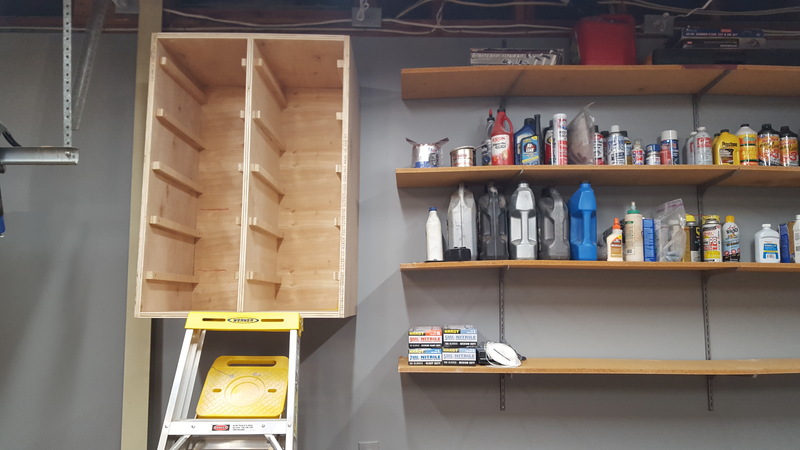 If I was building this again, I would cut a channel for the underlayment to slide in, but since I wasn’t planning ahead, it is screwed into the center support and then the three 3/4″ horizontal rails are screwed on top of it. The tubs are 12 1/4″ wide at the top, but the majority of the body is only 10 1/4″. Gluing two 1″ wide strips of 1/2″ plywood together on each side makes rails that the tubs can sit on. This was a little tedious to put together and attach, but each tub can be removed independent of the others which is very convenient. 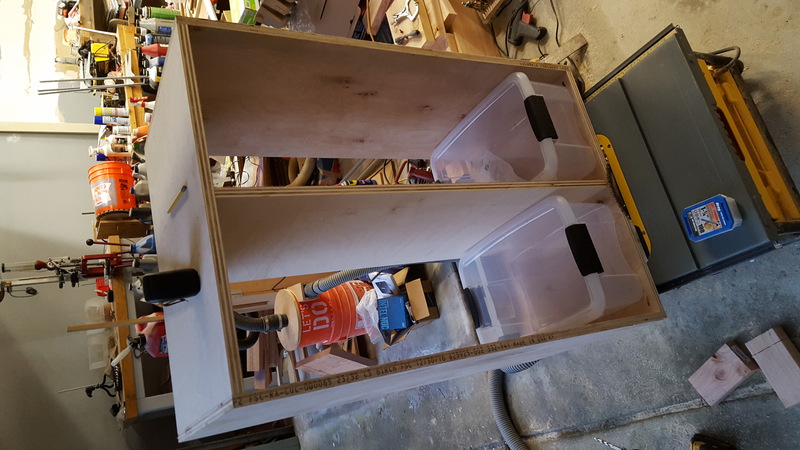 The rails are glued and screwed to the sides 7 1/4″ apart to give each tub 1/4″ clearance on the top and bottom. 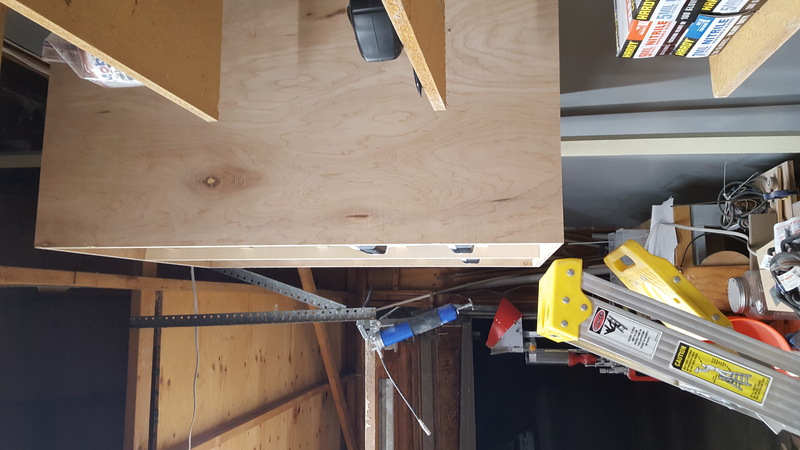 The top horizontal rail is a french cleat and with the case width being a little over 24″ I used 3″ screws to attach its mate to two studs on the wall. Once the case was mounted with the french cleat, I used more 3″ screws to attach the two lowers rails to the studs. I did a little reading on french cleat strength and it probably didn’t need the extra screws, but I figured it would give me a little extra security. 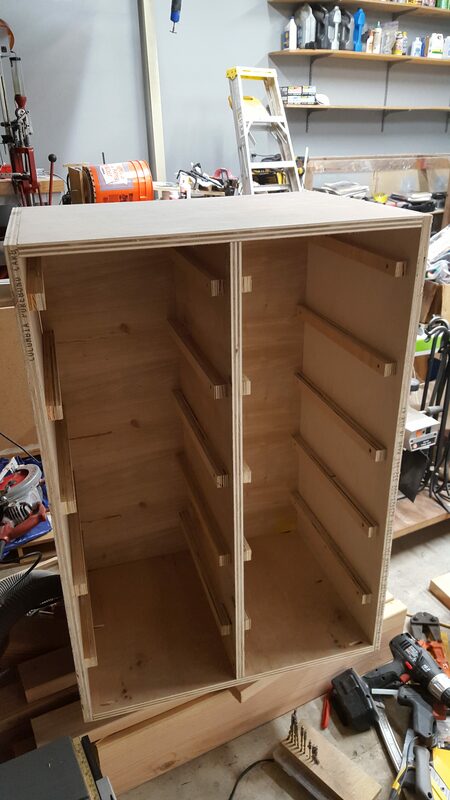 I toyed with finishing the cabinet but decided against it for now. It’s deep enough that a door can be attached to the front. If it gets too much dust inside and I’m not using it frequently I might add one, but I don’t know just yet. I was able to find a few similar projects out there. 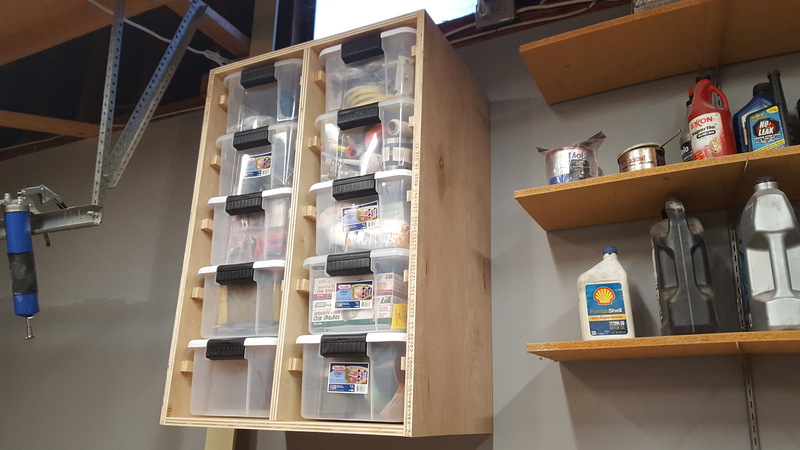 Most tend to be larger for full-size bins (see DIY Design Fanatic and Bin storage shelving (the easy way)) or smaller carts and cabinets for Sortimo-like storage products (see Inside Adam Savage’s Cave: The Tool Boxes and DIY Sortimo Storage Rack with Tool Station). 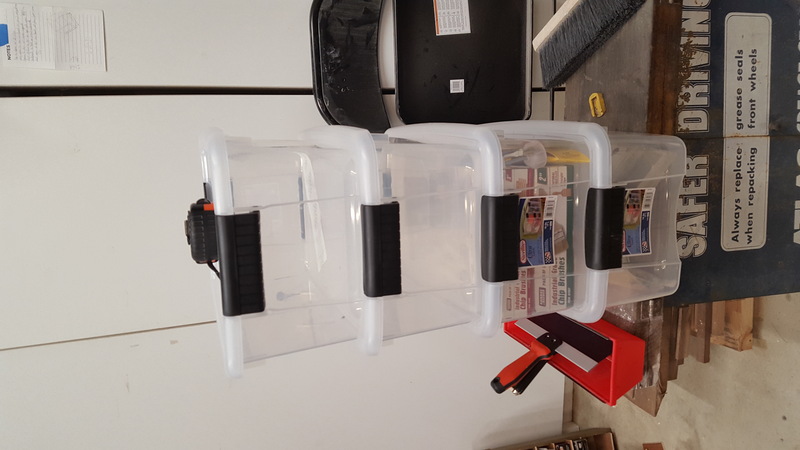 After looking at what folks have made, I used some of these ideas to design a hybrid-it functions like the Sortimo racks, but is installed like the larger bin racks.